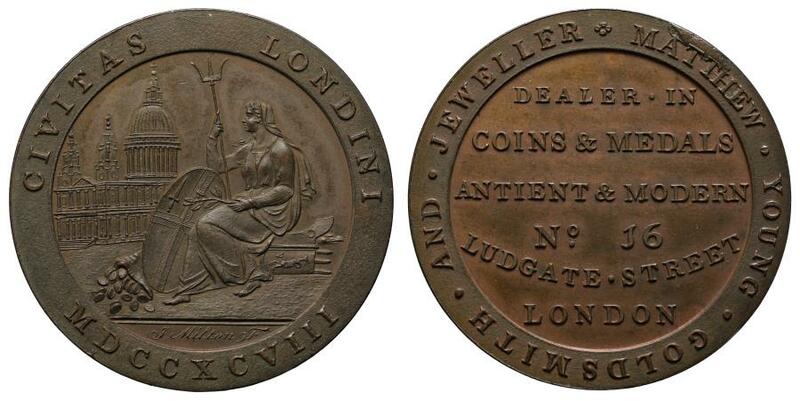 18th Century Token, Middlesex, copper Promissory Penny, 1798, issued by coin dealer Matthew Young, draped Britannia seated left on bow of ship, holding trident and palm branch, with shield bearing arms of the City of London, cornucopia of coins to side, St Paul's Cathedral beyond, italic signature of J Milton F. in exergue as maker, raised legend on raised border surrounding, date at bottom in Roman numerals, CIVITAS LONDINI, rev. struck en medaille, outer legend on raised border + MATTHEW YOUNG . GOLDSMITH . AND. JEWELLER surrounding six line inscription on field, DEALER. IN / COINS & MEDALS / ANTIENT & MODERN / No. 16 / LUDGATE. STREET / LONDON, edge inscribed in raised letters, +PROMISSORY. PENNY TOKEN PAYABLE ON DEMAND.+ weight 28.17g (D&H 41; Atkins 97; Stainton 42). Toned on obverse, reverse with a little lustre, raised die cud on reverse rim, otherwise extremely fine / good extremely fine and an interesting piece. This coin illustrated in "Coinage and Currency in Eighteenth Century Britain, The Provincial Coinage" by David W Dykes, page 269, number 292. With an old ticket giving a Spink provenance dating to December 1910. Australia, tokens, Melbourne Copper Halfpenny 1862 JNO ANDREWS & CO.